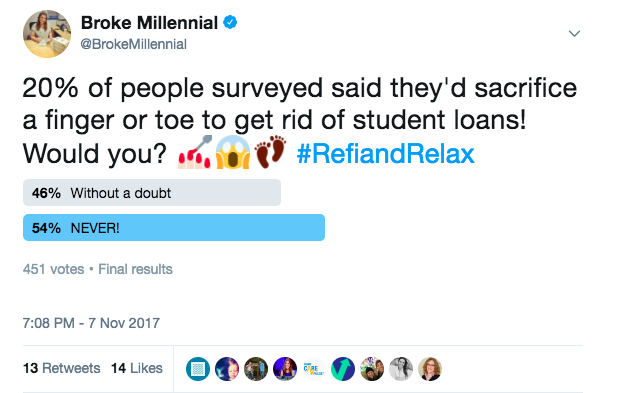 20% of people with student loans would be willing to cut off a finger or toe in exchange for being debt free, according to a recent SoFi survey. To be honest, I wasn’t terribly surprised when I saw that stat. What I found much more startling was the reaction on social media when I created my own poll to see if people would indeed dice off a digit in the name of debt. 46% of 451 people who voted on Twitter and 40% of 101 people who voted on my Instagram poll were willing to part with a finger or toe. That’s frightening. The fact that student loan debt is such a burden 20% or 40% or 46% of people would slice off a body part to be done with it. But, we shouldn’t be surprised. The burden of student loans has caused 50% of people surveyed by SoFi to feel anxious or depressed with 15% of people seeking help from a mental health professional. While I could easily go on a rant about the state of student loans and what being saddled with this debt is doing to millennials, I’ll inside focus on a potential solution to ease some of the pain: refinancing. 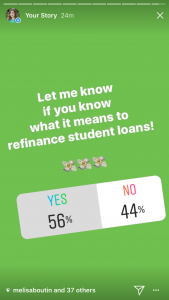 Refinancing often gets touted as a solution to student loan debt, but another poll I did unearthed that 44% of people didn’t even know what it means to refinance debt. The act of refinancing is simple: you take out a new loan to pay off the old one. That may sound a bit odd. Why are you getting more debt? The point is to lower your interest rate. For example, Jillian has a student loan for $20,000 at a 7% interest rate and another for $10,000 at 5.5%. She applies to SoFi and is offered $30,000 at 4.5%. She then takes the $30,000 and pays off her $20,000 and $10,000 loans. Now, Jillian only has to worry about one loan and it’s at a lower interest rate of 4.5%. She may be able to reduce her monthly payments, which frees up money to put towards other financial goals, or she could pay more than the monthly minimum and ditch the debt sooner. Either way, she’s still paying less interest over the life of the loan because she reduced her interest rate when she refinanced. On average, SoFi members who refinanced student loan debt save $288 a month and more than $22,000 over the life of a loan. That’s down payment on a home kind of money. To ease some of the student loan stress felt by its members, SoFi hosted a Refi & Relax party in New York City earlier this month. 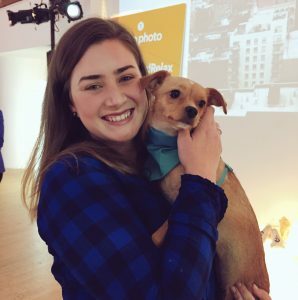 The free event featured comfort food, puppies, an open bar, virtual reality, and manicures. I attended the party and talked with SoFi members about what refinancing had enabled them to do in their lives. One woman spoke about having the flexibility to live by herself after being able to consolidate personal loans. Another could better budget her money in order to partake in other life events – like attending bachelorette parties as well as leaving a living situation after a breakup. The third woman was able to work on her goal to run all six world major marathons. Thus far she’s been able to do Tokyo and Berlin. 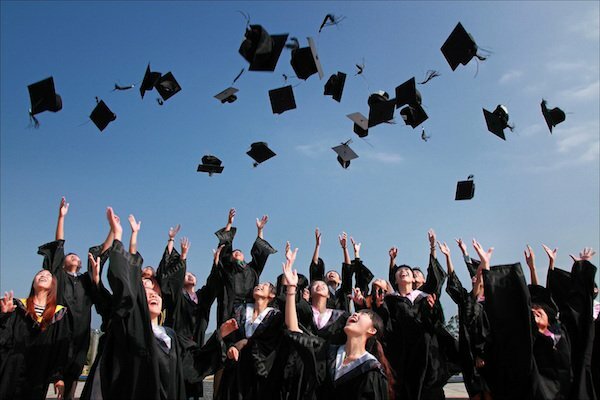 The member events SoFi puts on are certainly an added perk to refinancing your student loan debt. But the ability to get greater control over your finances and, consequently, your life is the real reason to consider refinancing. Watch my interview with SoFi members below!